WARNING: Do not attempt to repair any fracture of the shaft or handle! We do not recommend patching or taping a fractured oar, as the various stresses of rowing can further the damage. There is no guarantee that a repaired fracture will withstand these stresses, so repairs involving this extent of damage should be handled by Durham Boat Company, Inc. staff. The following types of repair can be done in the field: Blade replacement/reattachment, grip replacement, sleeve/collar replacement, decal replacement, handle clamp replacement, minor blade repair, and blade priming/painting. Durham Boat Company recommends several maintenance procedures to keep your oars in the best condition possible. Many problems can be avoided by following these easy processes. If you own adjustable oars and keep the handle set at the same position, it is likely that they will become stuck if they are never adjusted. To avoid this, every so often simply loosen the handle clamp bolt and slide the handle in and out a few times. Though all the hardware used on Dreher Oars and products is stainless steel, due to constant exposure to water, rust may develop. This can be prevented and fixed by applying a waterproof spray lubricant, such as Boeshield® (which can be ordered from Durham Boat Company) to all metal surfaces every once in a while. Every so often, look over your oars for damaged parts. Look especially at the blade, because catching and repairing the slight damage will prevent larger or irreversible damage. For information regarding questionable damage, call Durham Boat Company. Do Not store you oars sun. Do Not leave you oar in a closed up car in the sun, in the summer. Do Not place metal objects such as on top of your oars. Do place oars in padded oar bags when transporting oars on vehicles or in trailers, unless when trailering the oar on separate racks. Do change grips with when needed. Do Not twist the oar handle when adjusting the oar total length or the handle slot could be damaged. Do Not leave you oars against the boathouse in the wind or else they could fall over get damaged. The decal on the handle is meant to determine the overall length of your oar. The reading obtained at the interface between the handle and the shaft indicates total length. The sleeve decal indicates outboard length and is meant to determine the placement of the collar. To determine where to position the collar, subtract the inboard length from the total length (for instance, standard oars are 290cm total length, and 88cm inboard: 290 – 88 = 202). 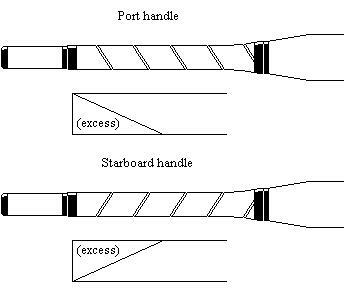 The same method is used for sweep oars. The handles will be marked as either port or starboard because of the slight differences in decal placement from oar to oar. Step 1: Slide the handle designated as “Port” into the port oar. Remove the tape on the handle and slide the handle into the oar, stopping at the desired length (designated by the decal on the handle). Remove the tape on the shaft, and with the 8mm wrench included (with all adjustable scull oars), tighten the bolt one full revolution to the right (clockwise). Be sure not to over-tighten the bolt, as you may begin to compress the carbon. Repeat this process with the starboard oar. Step 2: Pull firmly on the handle in an outward direction to confirm proper tightness. If the handle slips, tighten a quarter-turn clockwise and check again. If you have to replace the handles on your oars, the handles will be sent to you without the decals installed. This is done so that you can obtain the most accurate measurement possible for your oars. Step 1: Insert the handle into the oar and lay it down on a flat surface with the curve of the blade opening upward. Imagine a straight line running down the middle of the shaft to the end of the blade. Where that line touches the tip of the blade, place the end of the measuring tape. Measure the entire length of the oar and stop at the desired length (the standard length for adjustable scull oars is 289cm). Keeping the measuring tape in place, position the handle so that the tip reaches the desired length. Place a piece of masking tape on the handle where it meets the shaft, and release the measuring tape. Pull the handle out so that the piece of masking tape is accessible from the slotted side. To set the decal, place the measurement indicating the desired length on the edge of the masking tape that faces the slot (making sure the numbers grow as they approach the blade end). Remove the masking tape and affix the decal, making sure there are no air bubbles between the handle and the decal. Cut the decal at 5cm to each side of the desired length using an Exacto knife or razor blade (for instance, if the desired length is 286cm, cut at 281 and 291) and remove the excess. Finally, install the handle as explained above and repeat this process for the second oar. In the case that the decals on your sleeve are removed or rendered unreadable, new ones can be installed easily. Step 1: Place the oar on a flat surface with the concave curve of the blade is facing upward. Imagine a straight line running down the middle of the shaft to the end of the blade. Where that line touches the tip of the blade, place the end of the measuring tape. Measure 198cm and mark this point lightly on the sleeve with a pencil. Follow this point around the sleeve to the flat surface and place the 198cm marking on the decal on this point (making sure that the numbers grow as they approach the handle end). Cut off any excess using an Exacto knife or razor blade, and repeat this process for the second oar. Step 1: Place the oar on a flat surface, with the curve of the blade opening upward. Imagine a straight line running down the middle of the shaft to the end of the blade, and where that line touches the tip of the blade, place the end of the measuring tape. Measure 260cm and mark this point lightly on the sleeve with a pencil. Follow this point around the sleeve to the flat surface, and place the 260cm marking on the decal on this point (making sure that the numbers get larger as they approach the handle end). Cut off any excess using an Exacto knife or razor blade. Step 1: If the average oar length is 285cm and the spread of the boat is 160cm. The rule of thumb is to divide the spread in cm by 2, then add either 7cm or 8cm. That will enable you to determine your estimated inboard. After rowing with the estimated inboard you will be able to decide what the actual inboard is best for your physiology. Oar Total Length – Inboard = Outboard. The Average Outboard setting should be near the center on the Segmented screw lined up with the face of the Movable Bearing Surface Collar. However, the decal should be lined up with the Bearing Surface Couple, which is offset by a little over 2cm toward the handle end. If your average oar total length is 285cm and your oarlock pin spread is 160cm and you decide 8cm overlap feels good, then the average outboard setting for the collar Face that is part of the movable bearing surface facing the blade will be 197cm. Measure down the center line of the shaft to where that imaginary line interests the blade tip to the Collar Face to double check before setting the decal. Step 2: Place the oar on a flat surface with the curve of the blade facing upward. Imagine a straight line running down the middle of the shaft to the end of the blade. Where that line touches the tip of the blade, place the end of the measuring tape. Measure 197cm and mark this point lightly on the Movable Bearing Surface with adhesive tape and a pencil. Adjust the Movable Bearing Surface Collar’s Face closest to the blade tip is equal to the 197cm point. Then position the sleeve decal so that the Couple, facing the handle end and “Dreher Logo”, is just intersecting 197cm (making sure that the numbers get larger as they approach the handle end). Cut off any excess using an Exacto knife or razor blade, and repeat this process for the second oar. 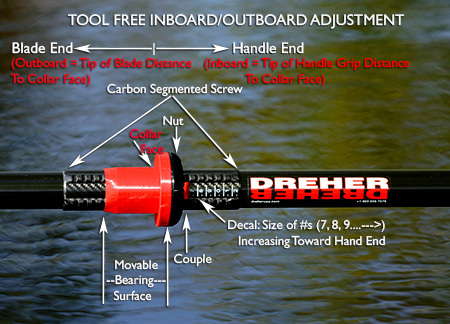 Alpha – Tool Free On-the-Water Gearing Adjustment. Alpha – Tool Free On-the-Water Total Length Adjustment. Due to the high amount of stresses associated with rowing, it is possible that the blade pitch may shift slightly. If you suspect that the pitch of your oars is not at 0 degrees, checking the pitch can be done easily, using a short piece of 2 by 4 board on a flat surface or if you have built an oar fixture (instructions for building a solid oar fixture can be found below). If there is need for pitch adjustment, this can also be done fairly easily. Step 1: Place a short piece of 2 x 4 (i.e., 12 – 18 inches) on a flat surface. Set your pitch meter to zero degrees on the 2 x 4 reference surface. Place the blade of the oar on the 2 x 4 with the tip of the blade extended 2.5 to 3 inches (~7cm) from the center of the board. The centerline of the shaft should be 90 degrees to the orientation of the 2 x 4 reference board. Place your pitch meter on the flat part of the sleeve adjacent to the collar on the blade side of the collar and observe the reading. We recommend adjusting the pitch for any reading greater than 0.3 degrees. Note: The oar fixture is used in a similar manner. Step 2: If the pitch needs adjustment, you will need to melt the glue bonding the blade to the shaft. If you will be using a blowtorch, first wrap a strip of aluminum foil (about 3-4″ wide) around the shaft near the blade in order to avoid scorching the carbon. If you have access to an industrial heat gun, the aluminum foil will not be necessary. Heat evenly around the shaft and avoid heating the blade. When the glue is melted sufficiently, place the pitch meter back on the sleeve and twist the shaft until you obtain a 0-degree reading. After receiving your new oars and installing your handles, you want to first establish the optimum overlap. The total length and inboard setting will be driven by your boat spread, skill level, strength, conditioning, and physiology. The wider the spread in your boat the greater your inboard setting should be. The greater the overlap that you can row with (within reason), the more leverage you have. Though many recreational rowers do not like any overlap, rowing a sliding seat racing shell is not like a rowboat; you are intended to have the left-hand pass over the right hand. For many people this is just a starting point, physiology, personal preference and ankle flexibility may alter the setting one way or the other. The more overlap that is desired, lengthen the handle in 0.5cm to 1cm increments until preferred overlap is achieved (10cm are available for handle adjustment). Likewise, if less overlap is favored, push in the handle in 0.5cm to 1cm increments. A shorter outboard will make the load lighter per stroke, but the height will increase. The opposite happens with making the outboard longer. 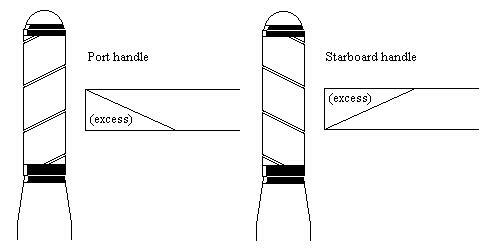 The apparent height will decrease and in rough water, the oarlock height may have to be increased. For non-wrapped grips, such as Martinoli or Stämpfli, removing old grips and installing new ones is a fairly easy task, except for the Form Fitting Grips. Step 1: To remove worn out or cracked grips, make a slit down the length of the grip with an Exacto knife, using caution not to score the carbon underneath. Remove the grip, and wipe away any water or dirt on the surface of the handle. You should see a thin layer of contact cement still present on the handle. If there is no contact cement, you may purchase some from a local hardware store and apply a thin coat to the area the grip will be covering. Let the cement dry before installing the new grip. Step 2: Tap the new grip down onto the handle, pulling down with the other hand at the grip’s base. With each tap on the top, some air will be forced down and progressively push the grip onto the handle. However, an optimal fit of the grip cannot be achieved by this method alone, so an air compressor is used to obtain the best fit. Place the open end of the handle on the corner of a table so that it is fairly stable, and blow air from the compressor through the hole at the top of the grip. Be sure to pull the grip down firmly, as this air can also quickly remove the grip. Also, use caution not to over-stretch the grip in this step. When you are finished, your grip should have no air pockets between it and the handle surface. Alternative Procedure: If a body water is nearby or if at a Regatta and you want new grips, please consider this underwater procedure: After the old grip has been removed, you place the oar handle of the scull underwater parallel to surface. Then fill up a new grip with water, while underwater. Then block the hole with your thumb and push the grip onto the oar handle in one quick motion. If it does not go all the way, then squeeze the part of the oar grip to allow water to flow back into to it. Then block the hole at the end of the and push again. Step 1: After removing the Remove the prior grip, as described above, wipe away any water, contact cement or other residues from on the surface of the handle that could cause friction. DO NOT USE CONTACT CEMENT! Step 2: Use only an air compressor. Place the open end of the handle on the corner of a table so that it is fairly stable, and blow air from the compressor through the hole at the top of the grip. Be sure to pull the grip down firmly, as this air can also quickly remove the grip. When you are finished, your grip should have no air pockets between it and the handle surface. Step 1: Clean-off the handles as described above, then apply an adhesive spray and let dry until tacky. Use the metric ruler as a straight edge and cut the line of the hypotenuse using an Exacto knife. Step 1: Clean-off the sweep handle as described above, then apply an adhesive spray and let dry until tacky. Step 1: Sand with 100-180 grit sandpaper until all the shine is gone, rinse and let dry. Step 2: Lightly prime with a spray can primer (either lacquer or enamel primer). Lacquer primer probably works best. Be careful to follow the safety instructions and adequate ventilation. Step 3: Let dry, then apply 2 to 3 more coats and let dry in between each coat. Step 4: Then sand with 400 grit sandpaper, rinse and dry. Step 5: Then apply a topcoat using either a lacquer or enamel topcoat. Important Note: If you start with a lacquer primer then use a lacquer top. If you start with an enamel primer, then use an enamel topcoat. Put on between three to five coats and let dry between each coat. No sanding between coats is required. Step 6: Let dry a minimum of eight hours before starting a design. After the base coat has been applied using masking tape and/or stencils to apply your club design. Before painting lightly sand the area where the design will go. Then paint area of the design. Step 7: For maximum protection, apply a clear coat after the painting is complete. Step 1: Sand with 400 grit sandpaper until all the shine is gone, rinse and let dry. Step 2: Then apply 4-5 topcoats of an enamel top coat and let dry between coats. Be careful to follow the safety instructions and adequate ventilation. Important: Do not use a lacquer topcoat, as it is not compatible with the urethane primer. No sanding between coats is required. Step 3: Let dry a minimum of eight hours before starting a design. After the base coat has been applied using masking tape and/or stencils to apply your club design. Before painting, lightly sand the area where the design will go. Then paint area of the design. Step 4: For maximum protection, apply a clear coat after the painting is complete. Dreher Oars are designed and built to withstand extreme use and conditions, but due to the high amount of stresses associated with very hard usage, a leak may develop. This is normally attributed to a small separation between the glue and the blade, which can be fixed easily. Step 1: Since almost all leaks develop at the interface between the blade and the shaft, wrapping this seam with electrical tape solves this problem easily. Simply wrap two or three times around the seam and the leak should be stopped. Remove any water still in the oar by removing the handle and setting the oar is facing down until all water has drained from the oar (for recreational oars, simply set the oar upright – there is a small hole at the end of the handle from which the water can drain). If problems reoccur, contact Durham Boat Company for further recommendations and/or instructions. If a hold is not present there simply drill a small in the handle end before draining the oar. NOTE: Due to the difficulty of this repair procedure, it is generally recommended that you send your oars to Durham Boat Company for a professional blade exchange; however, if this is impossible or financially impractical, the procedure can be done yourself. Finally, we can attach the two pieces to the long plank. First, attach the support to the end of the plank, and measure on your oar a spot roughly six inches from the back of the sleeve. Mark this spot on the plank and attach the cradle at this point. You should now have the completed oar fixture. If you have access to an industrial heat gun, the aluminum foil is unnecessary. However, if you are using a blowtorch, place a strip of foil around the shaft where it meets the blade, about 3 or 4 inches wide in order to prevent scorching of the carbon. Dreher oars use a hot-melt glue which allows the easy exchange of blades without damage to the blades being replaced. To this extent, the glue must be melted in order to remove the blade, so use the selected heat source to heat evenly around the shaft in a 3-inch area where the shaft and blade are joined. Use caution not to focus the heat on one spot, or to heat the blade, as scorching may occur. When the glue has sufficiently melted, pull the blade out of the shaft, using caution not to touch the heated areas or the melted glue. First, make sure the metal strip on the support of the oar fixture is level – this is imperative to obtain an accurate pitch measurement. If you have an electronic pitch meter, place it on the metal strip and calibrate it so that it reads 0 degrees. Check that there is glue already applied to the blades (all blades purchased from Durham Boat Company come with hardened glue applied); if there is no glue, apply a layer using a hot glue gun. Also, apply a thin layer to the inside of the shaft where the blade is to be attached. Mask off two inches of the shaft and the blade end to keep the glue from sticking to the outside of this shaft. Using the heat gun or blowtorch, heat both the glue on the blade and the glue inside the shaft until it flows (using caution to avoid contact with the glue), and insert the blade into the shaft, twisting one half-turn to ensure a complete seal. Place the oar on to the fixture, making sure the blade sits level on the metal strip of the support and the oar sits in the cradle(s). Place the pitch meter on the flat part of the sleeve adjacent to the collar on the blade side and rotate the blade until the pitch meter reads 0 degrees. Before the glue completely hardens, gently scrape off the excess, taking care not to change the pitch in doing so. Then recheck as explained in the Checking and Adjusting Pitch Section. After the glue hardens, lightly heat the leftover glue and scrape it off, leaving a clean surface. You may use acetone to clean the interface further. We use two types of sleeves: Martinoli and SRS. The Martinoli sleeves are black sleeves and are used on the fixed length sculls with red and green collars. The SRS sleeves are either red or black with black or red collars. The Martinoli sleeves have a top flat plate where we set the pitch. The SRS sleeves come in two parts of almost equal size, where the outboard decal is placed on one part and the pitch adjustment is conducted on the other. NOTE: Due to the difficulty of this repair procedure, it is generally recommended that you send your oars to Durham Boat Company for a professional sleeve exchange; however, if this is impossible or financially impractical, the procedure can be done yourself. Step 1: Though not imperative, it is highly recommended that you build an oar fixture (as explained in the Installing New Blades section). If you lack adequate time or materials, a solid, level surface to hold the blade of your oar will suffice. Step 2: First, place a piece of masking tape at one end of the sleeve and note the centerline of the top plate so that the new sleeve will be installed in the same position. Remove the screw in the side of the sleeve using a flathead screwdriver. Then, using the same screwdriver, pry off the worn sleeve. Slide the screwdriver under the flat part of the sleeve and pull upward. Once the flat part of the sleeve is removed, push the screwdriver under the remaining cuff of the sleeve. Push outward with the screwdriver, using it as a lever to remove the sleeve. Once the sleeve is removed, there will be leftover adhesive material attached to the shaft. At different times different adhesives were used: Some oars used an epoxy paste adhesive, while others used a hotmelt to bond sleeve to the oar. If your oars are bonded using an epoxy paste, you will need to chisel the hardened adhesive until most of it has been removed. If your oars are bonded using the hot-melt glue, the screwdriver may be used to pry off the glue. If the surface under the old sleeve is smooth, then first sand with coarse sandpaper (i.e., 80 grit) to have the best adhesion with the bonding material. Step 3a – Martinoli Sleeves Installation: Place your oar in the oar fixture or place the blade on a level surface. Mix the Bondo® according to the instructions on the can. Remove the top plate from the sleeve and using a putty knife, apply the Bondo to the inside of the sleeve, coating evenly. Push the sleeve onto the shaft (the tapered end pointing toward the blade) by pressing the slot to the area of the shaft where the sleeve will be placed. Once the sleeve is around the shaft, attach the top plate by squeezing the sleeve together and sliding the top plate into the grooves. Twist the sleeve until the top plate faces upward (note: the blade should be held level, at 0 degrees), and place the pitch meter in the middle of the sleeve. Adjust the sleeve until it reaches 0 degrees, and let dry. When the adhesive has completely hardened, insert the 3/32 or 7/64 drill bit into the electric drill. The side of the sleeve on which the hole will be drilled depends on whether your oar is port or starboard. Place the oar over the edge of a table so that the blade hangs off the end, the edge of the blade vertical. The sleeve should be in the correct position for the hole to be drilled. Mark a point roughly in the center of the sleeve, the smooth part facing upward, and drill through both the sleeve and the carbon. Insert a #6×3/8 inch stainless steel set screw in this hole, and repeat the process for the second oar. Step 3b – SRS Sleeve Installation on All adjustable Scull and Sweeps: Place your oar in the oar fixture or place the blade on a level surface. Mix the Bondo® according to the instructions on the can. Apply Bondo® to both sides of the sleeve, coating evenly. The top of the sleeve will be marked port or starboard. Place the center of the top even with the centerline mark that you placed on the masking tape prior to removing the original sleeve. Make sure that the starboard top goes onto the starboard shaft, etc. Mount the other half of the sleeve and install two of the 10 screws. Then set the pitch, install the remaining 8 screws and recheck the pitch. Note: When SRS sleeves are replaced after SRS sleeves have worn out, no adhesive is used to attach the sleeves unless crack is visible on the epoxy locating “seat”. The replacement sleeves need only to be screwed into place.